The incomparable workmanship and unsurpassed quality associated with Howard Miller is demonstrated in the impressive Howard Miller Sonoma Armoire Wine Cabinet. This Americana, cherry-finish hardwood piece features a raised door panel and room to store 22 wine bottles* with a generous amount of room for liquor storage. Open the dual armoire doors 180° and expose a glass mirror back, a wooden stemware rack, and a 3x power strip located in the center shelf for operating small appliances. Two side-by-side drawers in the center provide ample utensil storage and run on smooth metal glides. Laminated lift-up drawers are located inside the two drawers for additional work surface area. Automatic light is activated when full fold-back door is opened, and deactivated when door is closed. Dimension (doors closed): 75"H x 43"W x 23"D. Comes fully assembled. Dimension (doors open): 75"H x 76-1/4"W x 23"D. Comes fully assembled. A minimum clearance of 19- 1/8" is required on each side for the doors to swing open. Depth of Bottle Storage in Doors: 4-1/8"
The height for bottom (2) shelves is 19" but there is a rail which holds the bottles in place, thus the tallest bottle that would fit is around 14" in order to clear this rail. The height of second shelf from the top is 14-1/2' but there is a rail which holds the bottles in place, thus the tallest bottle that would fit is around 9-1/2" in order to clear this rail. The height of top shelf is 5-1/2" but there is a rail which holds the bottles in place, thus the tallest bottle that would fit is around 3-3/4" in order to clear this rail. Where is wine cabinet made? I don't remember exact southern state but in the U.S.A. I have no idea but they made it well. BEST ANSWER: Having just received this cabinet, I measured the width of the main body to be 38.5 inches. The exact dimensions of the Howard Miller Armoire are: 75"H x 43"W x 23"D.
The dimensions are 75"H x 43"W x 23"D.
does this come in a lighter colored wood Oak or Pine? BEST ANSWER: Unfortunately this only comes in the stain and wood shown. Is the back finished or does this unit need to be placed against a wall? BEST ANSWER: Thank you for your question, the Howard Miller is fully finished on the back. Is the Howard Miller Sonoma Armoire lockable? BEST ANSWER: Yes there is a lock for added security. Yes, this does have a locking door. BEST ANSWER: Thank you for yrou inquiry, here is the information supplied by the manufacturer: The stiles are 2-5/8” wide.The door handle back plate is approx. 5-3/8” long. The top of the back plate is located approx. 24-1/16” from the top of the door and the bottom of the back plate is located approx. 33-1/2” from the bottom of the door. The dimension between the handles is 2-3/8”, center to center. The handles are located approx. 42-3/4” off the floor on center. The stiles are 2-5/8” wide. The handles are located 42-3/4” off the floor. What kind of hinges are used on doors? The Sonoma Armoire Wine Cabinet features 180-degree door hinges. Is my assumption correct that at the widest point which would be at the top with the crown molding this cabinet is 43"s wide? Yes the top of the cabinet is 43". What is the width when both doors are fully open? BEST ANSWER: Thank you for your question, the width with doors open on the Howard Miller Sonoma Armoire Wine Cabinet is Approx 86”. Please feel free to reach our sales consultants at 800-356-8466, they will be able to assist further. Having just received this cabinet, I measured the actual width with doors open to be 76 inches, not 86 inches as stated above. How deep are the shelves in the doors? Measurements for door shelves. BEST ANSWER: Depth of Bottle Storage in Doors: 4-1/8"
Width of door shelf is 17-7/16". I only have 44 inches width in an alcove. Can I have doors open at right angles without pushing all the way back? That may depend on how deep the alcove is. If you cannot open the doors to at least 90 degrees, you will not be able to open the drawers. I'm not at home now, so I can't measure the depth from the back of the unit to the door hinges to determine how much depth you will need to be able to open the doors to right angles. I must say it's a well made unit and we are very happy with it. It did arrive with some minor shipping damage, but we decided not to return it and wait for a replacement. The unit closed is 38" wide. Each door is at least 6 inches added width when at a right angle. You do not have to open doors completely (180 degrees) to use, but to make your right angle (90 degrees) work in an alcove you would probably need more like a minimum 52" or so. I do not have exact dimensions that the doors extend when opened at a right angle, but 44 inches will not work. The cabinet is about 38" wide, and the doors are about 5-1/2" thick. If the front of the cabinet is "flush" with the front of the alcove, then 3" clearance on each side is not enough to let the doors open 90°. I believe the front of the cabinet needs to stick out from the front of the alcove by at least the thickness of the doors to let them open to a right angle. Unfortunately 44" is not wide enough for this unit when the doors are fully opened. What type of material (wood) is this piece made from? BEST ANSWER: The Howard Miller Sonoma Armoire Wine Cabinet is made from mahogany solids with cherry veneers on the door inset panels and mahogany veneer on the sides and internal components. I live in Australia. Does the 3 x power strip come with Australia power sockets , or do I need to have them converted from American to Australian holes? And does the cabinet plug in to a standard Australian 240 volt power point? BEST ANSWER: This is made for U.S. Voltage only . What would the width be if the 2 doors are opened ONLY just to allow the drawers to open (not fully opened) similar to one of the displayed pictures? A minimum clearance of 19.13" is required on each side for the doors to swing open. Can you supply this in an Oak finish? BEST ANSWER: Thank you for your inquiry. Unfortunately, this is the only color that Howard Miller provides. If you have any further questions, please contact us directly at 800 356 8466. Thank you again. do you have a freestanding front bar that would match the finish of this armoire Wine cabinet? Looking to use the Armoire as a back bar.Any suggestions? Currently, we do not offer a matching front bar for this armoire. What are the dimensions of the shelf space at the very top next to the stemware rack? What are the height and depth dimensions of the shelf below the drawers? I'd like to know if there's room in that space for the 12-bottle Silent Wine Refrigerator. 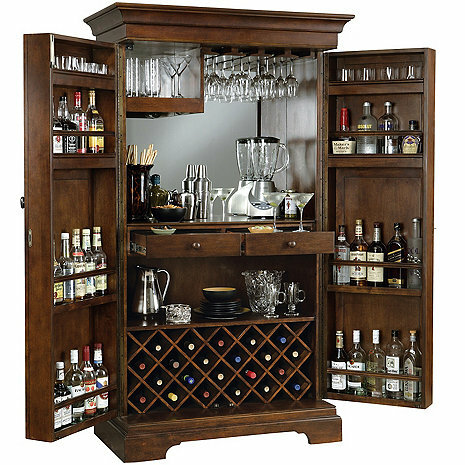 Can the Sonoma Armoire be delivered with a cupboard for additional liquor storage in place of the wine rack? I store my wine in a controlled environment. We were so pleased with this bar. Quality was beyond what we expected. Delivery was on time and in good order. The two men who delivered the item were very careful and considerate. This is a very nice piece and had the type of storage I was looking for so bought it sight unseen and prayed! It exceeded my expectation!! Beautiful piece and fits in with our dining room furniture perfectly. If you have high ceiling and will be looking down from the 2nd floor onto this piece, you will need to finish the top. Its an easy fix with a thin piece of wood and stain. This cabinet bar is an excellent example of what I have come to expect from the Wine Enthusiast-Howard Miller line. Elegant but useful high quality piece of furniture. I love it! Nice piece of furniture. Functional. Well made. Pleased to have the wine and bottle storage. Delivery just OK. Did nâ? ?t bother to let me know when it was not out for delivery and then didnâ? ?t notify on delivery day. Awesome cabinet! Well built and useful. Highly recommend it! It is the perfect size and is fits with my style. This is a beautiful piece. We loved the White Glove Delivery Service. We are very happy with the purchase!